A solid rubber tire must always be securely bonded to the rim for safety reasons, to prevent tire damage and ensure optimal tire performance, especially under the most demanding worksite conditions. There are 3 main types of solid tire mounts: press-on, rim-bonded and segmented. Each type has specific pros and cons. In this article, we discuss and compare the different types of solid tire mounts available on the market today in order to help you gain further knowledge of the options you have available to you. This will help you make informed decisions for your machine. As their name implies, these tires are pressed on to their rims using specialized equipment. The rubber is stretched to fit over the rim and friction holds the rubber to the rim. Installing these tires requires some level of expertise and is usually done at your local tire store. The tire is stretched using a press to securely fit the tire to the rim. Now, let us get into the pros and cons of the kind of tires. Press-on tires cost less upfront than rim-bonded tires. Under high-torque applications and under heavy loads, press-on tires may begin to spin on the rim. This is caused by a loosening of the tire-to-rim fit caused by operating the vehicle or equipment in heavy-duty applications. Press-on tires also slip in wet ground applications as water causes the rubber to loosen. Rim-bonded tires, as the name implies, are tires that come already bonded to their rims. The rubber is securely and chemically attached to the rims. Take a look at the pros and cons and decide if this tire is the right fit for you. No set-up required. They are ready for use, unlike press-on tires. They can withstand high-torque, demanding applications without the rubber slipping off the rim. Rim-bonded tires offer better traction as there is zero slippage on terrains that require tires with exceptional traction. Rim-bonded tires can be quite expensive. This is because if the tire has to be replaced, it is the entire tire that gets replaced as the tire is bonded to the rim. They offer less flexibility than press-on tires because the rims and tires can’t be used separately. A segmented tire consists of a system of separate rubber segments as well as nuts and bolts. Embedded in each individual rubber segment is a bolt which connects the tire segment to the rim. Segmented tires do not wear out all at once. Typically, one or a few rubber segments may wear out but they can be easily replaced without replacing the entire tire. No specialized equipment is needed to retread the tire. The machine operator can do the job with either a ratchet or wrench. Rubber segments (spare) can be easily stored on a skid steer loader or other heavy equipment. This saves a lot of time that would otherwise be spent leaving a job site to get a spare tire, should a tire be damaged during operation. The rubber does not slip off the rim – unlike conventional tires which may slip off their rim during demanding operations. 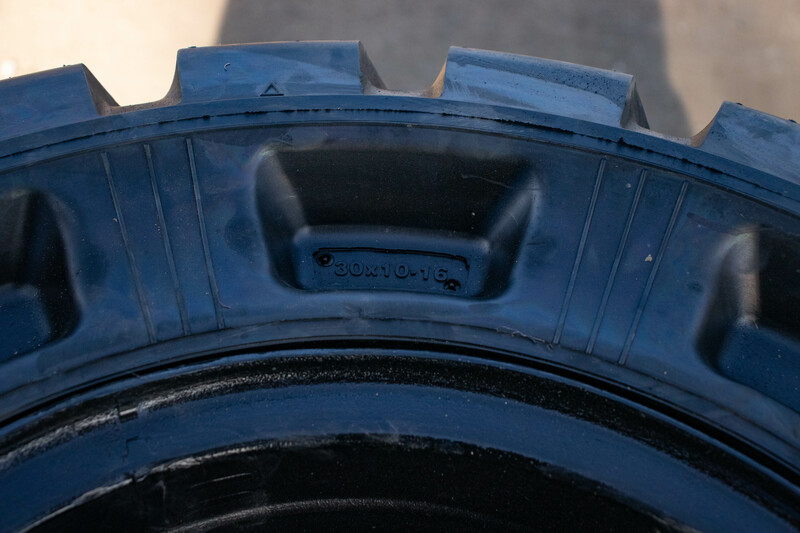 As the rubber segments are securely bolted on to the rim, there is no chance of the rubber slipping off. The type of tire mount you choose for your machine will depend on your budget and the severity of the application or terrain on which you will operate your machine. Keep in mind that just because press-on tires are cheaper upfront does not mean that you do not incur high operating and maintenance costs in the long run. Segmented tires are great when you want a tire with a secure tire to rim bond that will give you flexibility as well as relatively lower operating costs per hour. If you need help trying to figure out the best solid tire mount that will ensure optimal performance during your machine operations, contact Monster Tires.